This is the third time I draw her who I love so much. Beautiful composition and choice of colors! I have included this amazing artwork in the new feature for September 2017 on the front of the journal. Please the journal so that more members may see your art, and thank you for being a member. Beautiful... just beautiful! Excellent work! This is so beautiful! I love the tail on her tail and hair. Well you did a beautiful job. 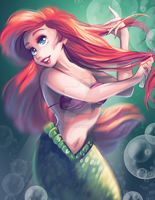 You have really captured the spirit of Ariel while managing to create her in your own wonderful style. Thank you for sharing your impressive work with us here @ . Have a great day and please check out our February art challenge if you get a chance. what happen to her left hand where the fish is floating? Oh, you're right! It's my fault LOL. I fixed it. Thank you so much for your comment !